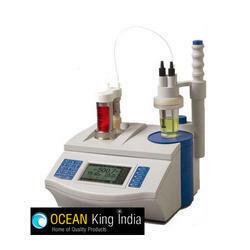 We are a leading Exporter of ocean series 1043b automatic potentiometric titrator from Ludhiana, India. Widely used in food additives, food safety, pharmaceutical production, petrochemical, quality control, research institutions. c). Support setting the system time, Operator ID, Burette type, Burette factor, Stirrer speed, Manual temperature, and Correction potential zero value. c). Complete record of the titration mode. Titration type. Titration start time. Titration end time. Operator. Stirring rate. Burette type. Burette factor. Titrant concentration. Sample volume. End number. Concentration. 9. USB interface, RS-232 printer port, supporting special titration software, a PC can be connected via the USB interface. On the computer can instantly display the titration curve and its first and second derivatives. mV value: (-1800.0 ~ 1800.0) mV; Temperature values: (-5.0 ~ 105.0) °C. pH value: 0.01pH; mV value: 0.1mV; Temperature: 0.1 °C. 4. Burette capacity tolerance 10ml Burette: ±0.025ml; 20ml Burette: ±0.035ml. 6. Titration analysis Repeatability: 0.2%. 7. Electronic unit repeatability error: ≤ 0.2mV. Looking for Ocean Series Automatic Potentiometric Titration ?